facts? You've come to the right page. If only one plant could be deemed the most influential, important plant to human kind and the ecosystem, which would it be? Without a doubt, the one plant that has the widest range of use and the widest spread of habitats would have to be bamboo. Bamboo deserves a small introduction before we go into why it is quite possibly the worlds most influential plant. Bamboo is a woody perennial evergreen plant that is actually part of the true grass family. Although they can grow to towering heights, bamboo is not actually considered a tree. Bamboo belongs to the family Poaceae, subfamily Bambusoideae, tribe Bambuseae. Bamboo along with being one of the tallest grasses in the world, is also the fastest growing plant in the world, capable of growing 3 to 4 feet per day! Bamboo can be found all over the world in varied climates, from the cold mountainous regions to the hot tropical areas. They can be found in North and South America, throughout East Asia, northern Australia, and southern Africa. Now that you have a rough idea of what bamboo is and where it grows, you should be familiarized with the diverse range of uses that have been devised for bamboo. Bamboo is a huge business worldwide, and provides shelter, utensils, furniture, and food for some 2.2 billion people. Bamboo has some amazing properties that have been manipulated by mankind over the ages. Bamboo is used in functions from reinforcement of concrete buildings in place of steel rebar, to meals for millions of people in the orient. Although mature bamboo has tensile strength greater than mild steel, its shoots are tender enough for human consumption. Bamboo is used in scaffolding architecture for high rise buildings across the far east, and is used to make strong light plywood boards that are used in every construction application you could imagine. Bamboo can be used to cook in, eat off of, eat, sit on, walk on, ride on, and live under. There have been methods devised to take advantage of bamboos astronomical growth rate in the search for sustainable fuel. Bamboo briquettes are on the market today, and means have been devised to make ethanol and even diesel substitutes from bamboo. Bamboo furniture is light, durable, and affordable. Bamboo is utilized in ways so numerous that one resources lists more than 5000 uses for bamboo. Check out the bamboo tiki bars page to spruce up your garden. Bamboo has an average return on investment in the case of plantation of 3-5 years, as opposed to some 10 years for other types of wood. In short, bamboo is the material and even food of the future. Along with its tremendous material and food value, bamboo has an enormous ecologically potential. In an age ridden with fuel wars, and an ever declining ozone layer, natural products like bamboo have taken a front scene in the international energy crises. Bamboo can be utilized in the production of renewable ethanol and diesel. Also, ecologically speaking, the utilization of bamboo may save our environment because of the massive amounts of carbon dioxide that is sequestered while it grows. Bamboo utilizes carbon dioxide at a rate astronomically higher than other trees, and does it year around because it is an evergreen. Fuel made from bamboo would have a neutral carbon dioxide impact because any fuel made and burned from bamboo will release the same amount of carbon dioxide into the atmosphere that was consumed by the bamboo while it was growing. Along with the fuel possibilities, bamboo has the fastest reforestation potential of any plant, making a new canopy in burnt landscapes in a matter of months. Bamboo is an environmentally safe, renewable source of fuel and building material that has a positive effect on the environment in an age ridden with ecological problems brought on by the widespread use of fossil fuels. Bamboo is quite possible the golden chicken amongst plants. With time and dedicated research, perhaps our future will be a bit brighter due to the widespread use of bamboo. Do not be surprised to see a bamboo plantation pop up in a field near you! 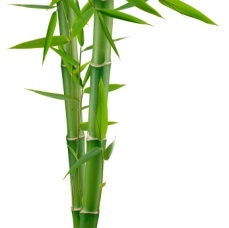 Need more information, click to learn more bamboo plant facts!